The structure of the park is termed the "Pilanesberg National Park Alkaline Ring Complex". Ancient, even by geological time scales, this extinct volcano is the most perfect example of an alkaline ring complex. A number of rare (but not necessarily economically important) minerals occur in the park. Pilanesberg National Park rates high amongst the world's outstanding geological phenomena. 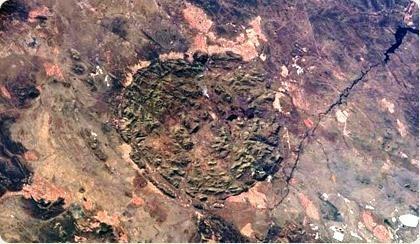 Pilanesberg has survived ages of erosion and stands high above the surrounding bushveld plains. The early presence of man can be seen in the numerous Stone and Iron Age sites that are scattered throughout the park. The park exists within the transition zone between the dry Kalahari and wetter Lowveld vegetation, commonly referred to as "Bushveld". Unlike any other large park, unique overlaps of mammals, birds and vegetation occur because of this transition zone. Springbok, brown hyena, the red eyed bulbul, and camel thorn trees usually found in arid areas are found cohabitation with moist-area-limited impala, black eyed bulbul and Cape chestnut trees. The colourful hues, varied habitats and panoramas will delight and entertain photographers and visitors. The very topography makes the area a feast for the eye. Here are syenite koppies, thickly forested ravines, typical bushveld and also rolling grasslands and lightly wooded areas. Off the centre of the park is Thabayadiotso, "the Proud Mountain". The Park ranks among the largest of the national parks in South Africa (it is in fact the fourth largest park) and covers an area of 55 000 hectare. The beauty of Pilanesberg is reflected in a large central lake, the Mankwe Dam. Over time, wind and water have carved a spectacular landscape with rocky outcrops, open grasslands, wooded valleys and thickets.The creation of the Pilanesberg National Park is considered one of the most ambitious programs of its kind to be undertaken anywhere in the world. The Operation Genesis, which involved the game-fencing of the reserve and the reintroduction of long-vanished species, began during the late 70's. Today, Pilanesberg National Park accommodates virtually every mammal of southern Africa. Also home to the Big Five.